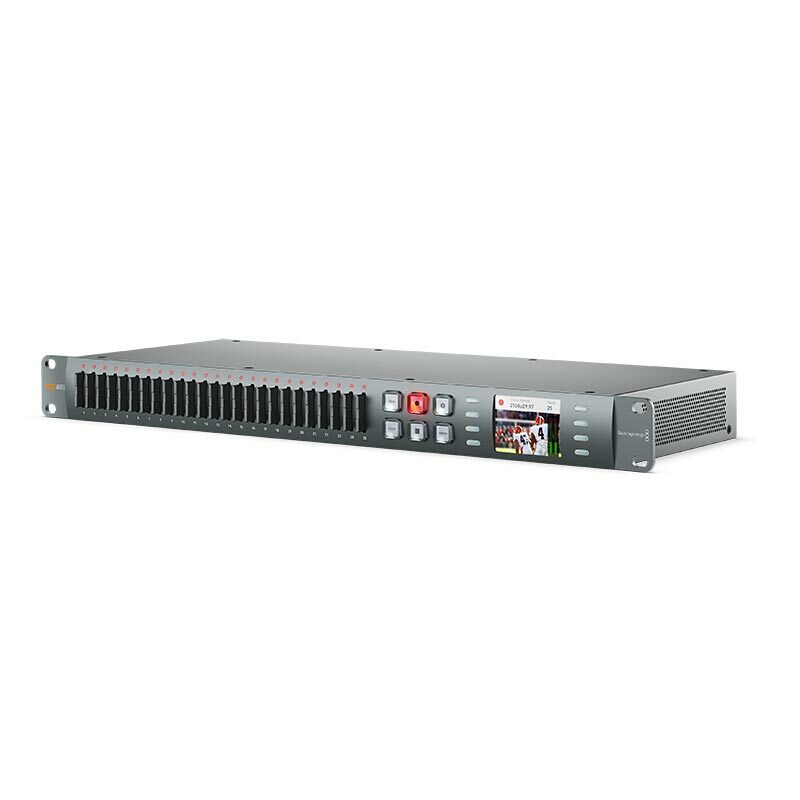 The Blackmagic Duplicator 4K makes it easy to deliver multiple copies of content to customers the moment an event is finished. You get an SD card duplicator with built in realtime H.264 and H.265 encoding. H.264 works with the devices you have today, while H.265 is the new standard for delivering Ultra HD. 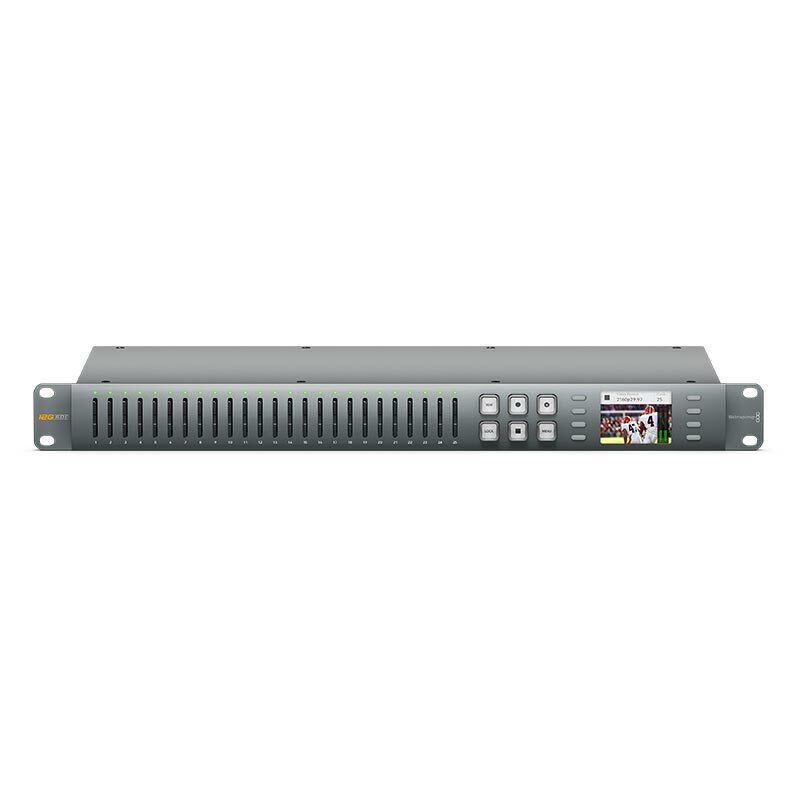 The Blackmagic Duplicator 4K is the best way to deliver Ultra HD content that customers can actually view on their 4K televisions today. 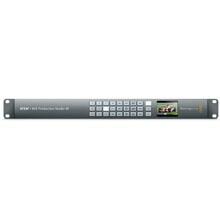 The multi rate 12G-SDI connections let you record in all SD, HD and Ultra HD formats, up to 2160p60. H.264 and H.265 encoding gives you high quality video in smaller files so you can use smaller and cheaper SD cards. You can even connect multiple duplicators together to make hundreds of recordings all at once. Now you can sell video at live events the moment they finish. The best time to sell content is right after an event when people are still excited about it. Now you can capture the enthusiasm of impulse buyers and instantly sell them a copy before they walk out the door. Imagine selling a video to fans where they can see themselves in the audience. Now you can record a concert and make it instantly available while they’re buying t-shirts and other memorabilia the moment they leave. Every loving parent wants to purchase a video of their kid’s latest performance or recital. Now you can capture the impulse buy and sell theater, dance, and music performance videos to parents the moment their kids leave the stage. Capture the emotion and excitement of a wedding for all guests. Use the append record feature for a single movie file of the entire day even if the recording is stopped and started as the wedding moves from ceremony to reception. Whether it’s a sales conference or technical seminar, attendees can leave with a copy of the day’s presentation. When the company’s international staff get back to their office, they can play it back on the big screen and share it with the team. The Blackmagic Duplicator 4K can encode video using the latest H.265, which is the new standard for Ultra HD delivery. You get realtime hardware encoding for incredible looking Ultra HD video, even at high frame rates up to 2160p60. The files are small, the image quality is incredible and the data rates are low enough to play back from standard SD card media. You can even play back Ultra HD 2160p60, which is 4 times the size of regular HD and twice the frame rate. Now you can deliver dramatically better looking video to your customers using small and affordable SD cards. Everything you need to encode, duplicate and sell content at live events. 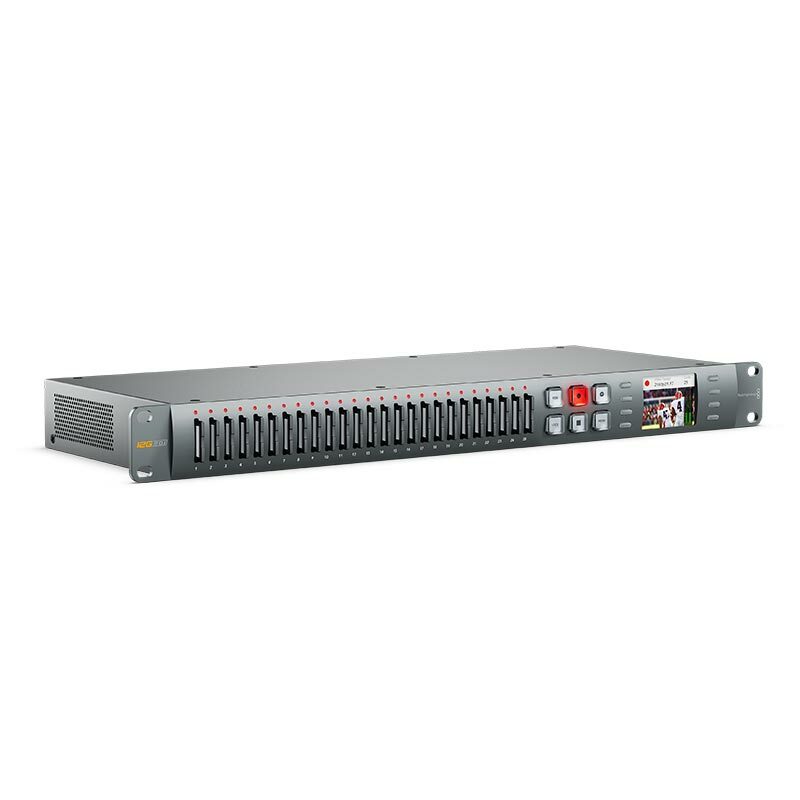 The Blackmagic Duplicator 4K features a realtime encoder for H.264 and H.265, along with 25 SD card recorders that are miniaturized into a single rack unit design. The machined metal design is durable, lightweight and small enough to take anywhere. That means you can duplicate content right where you’re recording and selling it. You get an attractive LCD display for status, professional broadcast connections such as 12G-SDI with loop through and RS-422 deck control so you can connect multiple units together and record more cards at the same time. There’s no better way to deliver content than with super small, high speed SD cards. SD cards are readily available, affordable and are compatible with computers and TVs. Plus, when it comes to packaging content quickly, they’re easy to label and put into attractive, presentable wallets that look great at point of sale. The Blackmagic Duplicator 4K records using H.264 or H.265, so you can easily fit a one hour Ultra HD program onto an inexpensive 8GB SD card. Best of all, the cards can be re-used, so the extras can be recorded over and used again at your next event. The Blackmagic Duplicator 4K records video in an open file format using H.265, which is the new standard for Ultra HD delivery. For maximum compatibility with existing HD televisions and some computers, you can also choose to record using H.264. SD cards can contain SD, HD or Ultra HD video and work with both Mac and Windows computers. You can even use a USB adapter to plug them directly into your Ultra HD television set. Unlike proprietary disc based formats, like Blu-Ray, you don’t have to buy a slow and expensive player. The Blackmagic Duplicator 4K is the easiest, most compatible and cost effective way to distribute Ultra HD content today. Blackmagic Duplicator 4K: shipping now! The new Blackmagic Duplicator 4K was designed to solve the biggest problem we see the television production industry faces today. This problem is how do we get Ultra HD content to customers, and let customers take advantage of the big screen Ultra HD televisions they have been buying. How can we do that, right now, today? Addition of Logging mode, which allows the SD cards to record sequentially.